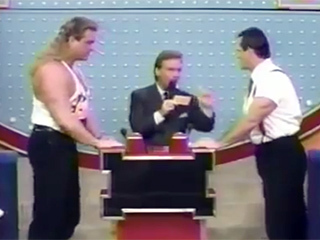 INDUCTION: WWF on Family Feud in 1993 - The Ultimate Battle of GOOD VS. EVIL!!! - WrestleCrap - The Very Worst of Pro Wrestling! 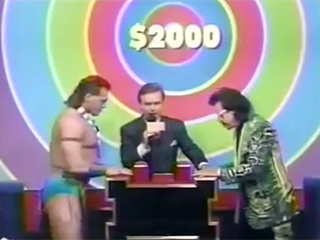 WrestleCrap just hit its 18th birthday earlier this month, and during nearly our entire existence we’ve loved inducting game shows featuring pro wrestlers. Be it Double Dare, Singled Out, or even other episodes of Family Feud, it’s a true passion for us. I mean seriously, what could be better than watching your in-ring favorites forgo attempting to KO each other, but instead battle with their wits in an unscripted setting? And trust me, when I say “your in-ring favorites”, I could never possibly mean it more than what I am about to present this evening. Fun fact: this induction actually started as an entirely different one – I was going to cover a different wrestling episode of Family Feud, one which took place in 2007. 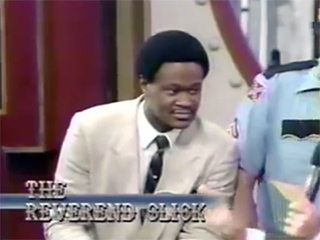 In fact, I was about halfway through it when I discovered THIS episode of the Feud. Taking place in 1993, it featured a veritable cornucopia of WrestleCrap inductees. We’re talking Batista or Papa Shango. I know you’ll agree I made the correct choice. With that said, I won’t let that other partially written induction go to waste, however – I plan on finishing it in the next week or so and putting it up as a Patreon exclusive. So be a dear, and throw a couple bucks our way, won’t you? But not poor us. Oh no, not poor us by ANY stretch of the imagination. 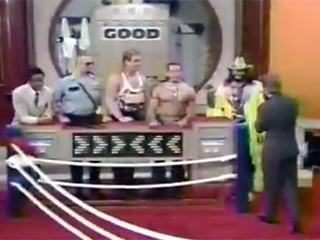 This may be the single greatest pro wrestling game show EVER. Enough hyperbole – let’s play THE FEUD! 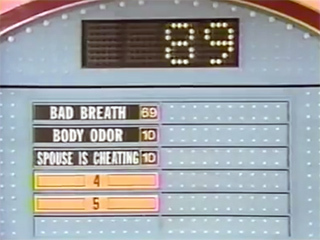 If you have no understanding of how Family Feud is played, click here – I don’t want to waste valuable keystrokes explaining it when The Repo Man awaits. 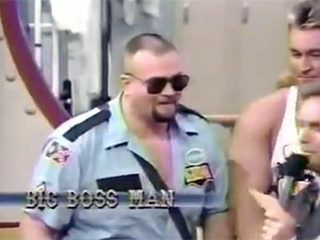 Yes, THAT Repo Man, of stealing children’s bikes on WWF television Repo Man fame. He’s a CONTESTANT ON THIS SHOW. A major, major, top of the card contestant! I seriously may have never been more excited to write about anything in YEARS. 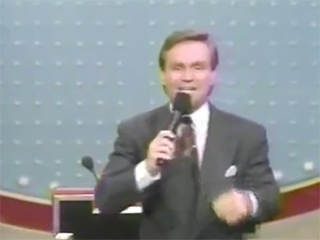 Allow me to introduce you to our host of the festivities, Mr. Ray Combs. 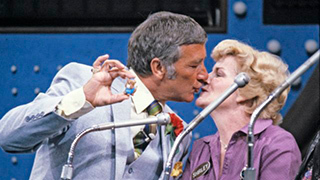 Combs would have been the second host of Family Feud, and he was the poor soul with the impossible task of attempting to follow Richard Dawson. He appeared at a WrestleMania! WrestleMania VIII, to be exact (and I was there live! 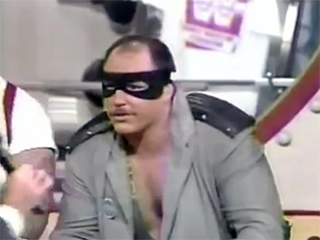 ), and during his appearance, he insulted the Nasty Boys. Eh…maybe he was better than Dawson. I didn’t like them either, Ray! I legit can’t stop laughing at that. 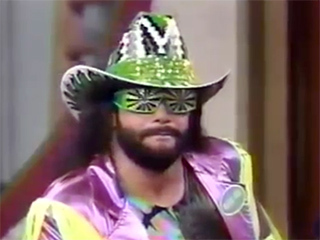 The patriarch of Good would be none other than “Macho Man” Randy Savage, all decked out in the most ghastly neon purple and green inks spandex could contain. Macho explains to us that they will be “rocking and reeling and dancing on the ceiling” as they play for the WWF’s very own HEADLOCK ON HUNGER. OH YEAH! Over to the EVIL side we go, where Shawn Michaels is at the helm. HBK explains that they are playing for a Boy Scout troop out of Las Vegas. I’m not entirely sure, but I almost think that has to be a rib. Sounds like a code for something. He then laughs in Savage’s face like a total douchebag. Serious question: how is it possible that we had Randy Savage and Shawn Michaels both in the WWF, both near the primes of their careers (Savage slightly past his, HBK slightly before), and the only FEUD we ever got was of the FAMILY variety? 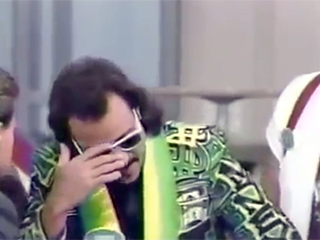 Next up, we get Jimmy Hart vs. Tatanka (BUFFALO! ), who are quizzed with “Name somewhere families go almost every Sunday.” The Native American correctly calls out “church” then spins around in a dance so unremarkable I won’t waste a GIF on it. Trust me, you ain’t missing anything. Besides, I cannot be the only one bothered when I note that so far, Tatanka is the only guy showing up in only his wrestling skivvies. Put on some pants, Chavis! 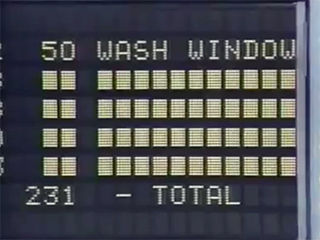 …the always incredible REPO MAN. Mad props to him for doing a little duke-a-roo in an attempt to intimidate the law man from Cobb County in this war of intelligence. “Name someone associated with Julius Caesar.” And we get…silence. Ok, that’s almost as good as the faux punches. 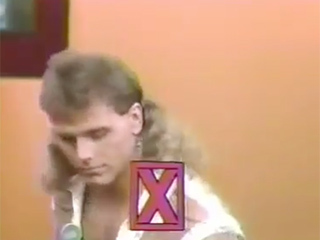 While I have zero doubt Shawn heard that plenty of times during this stage of his life, it gets the big ol’ red X signifying no one surveyed answered in a similar manner. Sorry, kid. 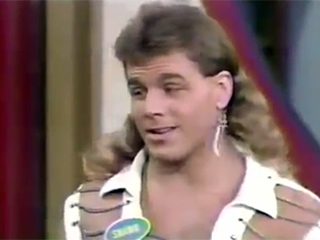 Macho notes that folks may be like Shawn Michaels…and thus it’s bad breath! Good job, Mach! Let’s celebrate by listening to your amazing WCW theme! The good guys decide to play, and next we get Tatanka suggesting that folks may not want to tell you about your acne. He is so pleased with this (terrible) answer that he gives us yet another screwball dance. This screwball dance to be exact. No wonder it never rained on the reservation. That strike was for his answer, not my joke, although I could see it applying to either. Crush goes with body odor. Eh, the big guy made the right call. Bossman, what do you think? Combs, although seemingly baffled by the response, attempts to bail the big guy out by saying he apparently meant you had foot odor. The former ghetto blaster blaring jive talker turned man of the cloth notes that something you may not want to tell a friend is that there has been a tragedy in your family. Ok, that’s at least better than your shoes smell bad. But not enough that anyone would possibly answer it. And almost poetically with that answer, the bad guys take the lead. 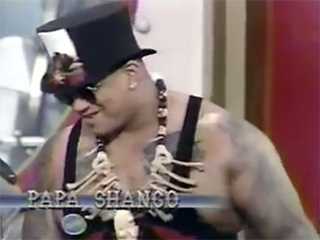 This would lead to our first commercial break, but before we go there, let’s stare for an uncomfortable amount of time at Papa Shango’s chest. I have no clue why the director would decide to point the camera at the big guy’s pecs for a solid 10 seconds, but he does. It’s probably one of those mysteries in life left best unsolved. 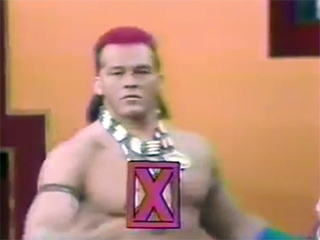 Tatanka jumps in and tells us he’d ask his tanked kimosabe to hit the bricks. Thinking I am glad I never partied with either of these guys. Irwin (or as Combs calls him, “THE IRS MAN”) brings some sanity to this, noting he’d call his buddy a taxi cab. 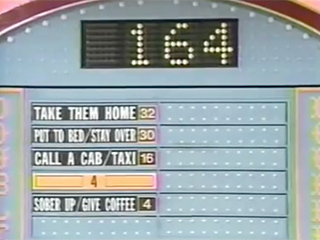 That would be the third most popular answer, which gives the do-gooders one last chance to take control. Which they do when Kona Crush says he’d give them a ride home. Hopefully on a surfboard, and his lush cronie would be residing at a luau. The Slickster tells us he’d put them to bed, which is ALSO up there. So the good guys only need ONE more correct answer to put them into the lead. Nor do they get it from Tatanka, who says he would shove food down their gullet. 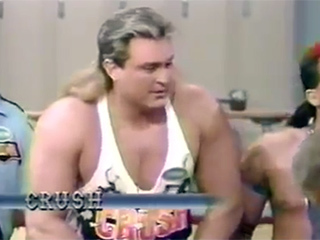 Crush decides to one-up Macho by stating he wouldn’t simply tie his friend up, he would BEAT THEM UP instead. The heck with Crush and Savage, I don’t want to party with ANY of these fools. Fortunately, it’s Shawn to the rescue, noting he’d take their keys. Winner winner. With that, the bad guys are just running away with this, and it’s going to take a miracle for Savage and his drunk friend pummeling lackeys to make a comeback. 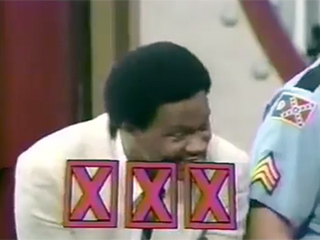 IRS vs. Crush gets us started, with this brain teaser being posed: “Name something you might do for a little old lady.” Irwin notes he’d help her across the street. I thought this guy was a heel? Regardless, it’s the top answer and the heels take control once more. Repo says he’d help her with her groceries. (If that’s the case, she better not have put that asparagus on a payment plan, or it will wind up in Barry’s fridge.) 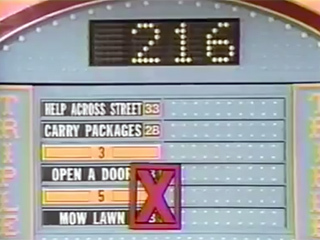 Amazingly, they give “carry packages” to him as an equivalent answer, which is in fact the second most popular response. Papa Shango says he’d open the door for her, which is also up there. 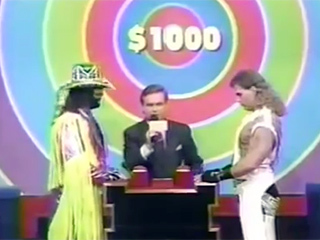 You’re lucky, pal – if I had been the judge, I would NOT have accepted that answer, solely due to the fact that Shango didn’t even bother to put his voodoo white face on for this show. Not giving her money – LENDING her money, apparently until her social security check shows up. I’d be hanging my head too, Mouth. …before it all comes crashing down when Repo suggests he’d give her a ride. I bet if he had said “on the bike I repo’ed from that 10 year old”, it would have been on the board. All of this leads to what would be the good guy’s final shot. Could they somehow toss a Hail Mary to help out the Somalians? Last chance…what is something you could do to help a little old lady? Shockingly, Granny wasn’t looking to get roided to the gills. So the bad guys win, and thus they get to choose two folks to compete in the bonus round. As you would expect, Shawn takes center stage as one of those competitors. REPO REPO REPO REPO MAN!!!! — What is something gas station attendants used to do for you in the old days? — Something that chocolate candies are filled with. — A sport where people get hit. — Something people where that is white. — Something you squeeze lemon on or in. Just like that, Shawn proves he isn’t just Mr. WrestleMania, but Mr. Lightning Round as well. Heck, he almost got the whole 200 by himself! 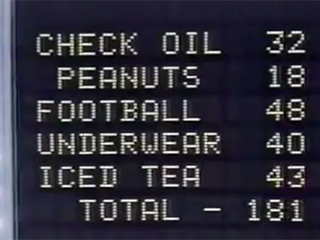 For the record, these would be the answers that our hero gave in hopes of garnering those 19 points. Lets roll out those answers! What, you thought he’d need more than one? If I don’t see that exact same image take the inter webs by storm in the next 48 hours, I’m giving up all hope in humanity! 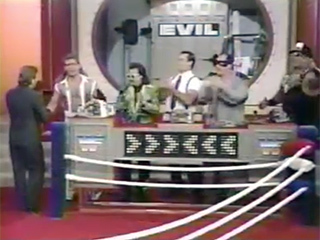 32 Responses to "INDUCTION: WWF on Family Feud in 1993 – The Ultimate Battle of GOOD VS. EVIL!!!" “Irwin notes he’d help her across the street. I thought this guy was a heel?” Hilarious! BTW for a 1993 show, they were really rocking with a bullseye board that could’ve been painted during the Nixon administration. which is weird because they could have easily mainainted kayfabe by mentioned/declaring something along the lines of “that’s what these fools do” etc. This might be my favourite induction of all time. Everything about it from the Family Feud, to RD’s amazing write-up which was simply brilliant, funny, and even informative all wrapped into one. I may be alone on this but I think the name tags they had would make for an awesome Somebody Bought This. You’d definitely be the coolest person around with one that says “Papa Shango”. Although Shango’s lack of face paint was a letdown..not to mention forgoing using his black magic to make an audience member vomit; a missed opportunity to be sure. That would have been ideal, definitely. Maybe Shango cursed the Good team instead? That would explain the ridiculous answers Savage and Crush came up with. I wish Tatanka and Repoman would come back as a tag team. Would they be called The Indian Givers? The gif at the end literally has me in tears. OK so this may be WrestleCrap… but Barry Darsow is awesome! No crap there. He basically stays in character, comes out for the bonus round with that quick look around just like when he would enter the ring (which I guess he was as I look at the studio set), and even adjusts his jacket properly with a shoulder nudge finish for effect. Hole in one! And of course Captain Mike does ok in this battle of wits. Varsity Club man and all that. Sad to see three members of the Good team have passed away. 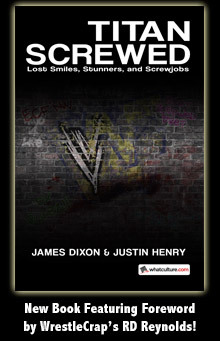 I’m pleasantly surprised at the ending, I’ve seen the final round lost from similar positions and I thought maybe Repo would have given some comedy answers (plus wrestlers are often stereotyped as being idiots) so it’s actually refreshing to see them win so easily. My one friend informed me that HBK and Macho Man had just 1 match in a UK tour that’s on VHS he’s seen. 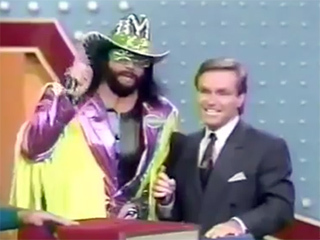 But otherwise that was it due to the transition of Macho Man to commentary by Vince and leading to his leave to WCW. Love your game show entries too. Family Feud ones are the best and even the Who Wants to be a Millionaire entry was good even if I didn’t like the show’s hostess. It makes me wish today we’d get some today, even if they showed up to show off prizes on the Price is Right like other celebrities I’m sure it would be a hit! 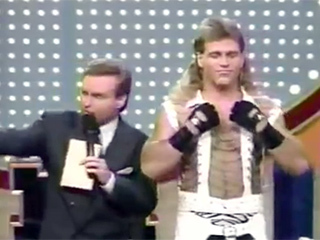 I remember hearing somewhere (might’ve been a shoot with Lanny Poffo) that Savage did wanna do an angle with HBK, putting him over in sort of a passing-of-the-torch moment. But Vince, or someone else higher up, wouldn’t go through with it, because they’d already deemed Savage too old to wrestle or to promote. Which was one of the major reasons why Savage did head over to WCW. I read about this too. Supposedly Savage wanted the feud to start in ’94 and lead to a match at WM11 (another reason why he wanted it was because he believed Michaels was the only opponent who could possibly help him to top his WM3 match with Steamboat). 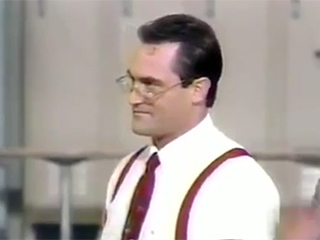 hey art could you induct THE brian kedrick’s appearence on price right??? 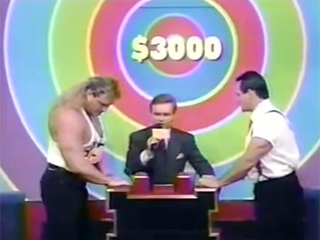 i think about the only game show that wrestlers have never appeared on might be jeopardy…but don’t quote me on that as i am not sure if thats true or false??? This is a fantastic induction. 1993 WWF…good heavens, what happened in just a few years time? Was it GLOW? I do remember the WCW side being captained by Sting but couldn’t tell you much else. I remember watching this episode when it aired. I made sure not to miss it. I never saw these but I did see the week of FF shows with WWF vs. WBF superstars, LOL. 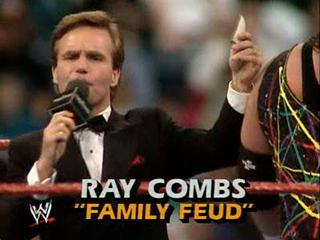 I so remember this Family Feud. Because it aired around the same time of WM IX. 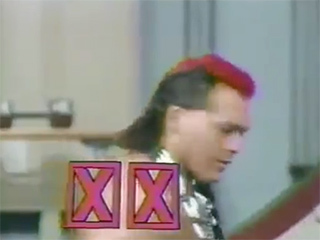 I thought for sure that Shawn Michaels and Tatanka at some point were gonna come to blows and kept watching that whole week, on a cable network called ASN which no longer exists. Maybe I’m in the minority but I thought that for the Raw 25th anniversary they should’ve had Charles Wright do a one-off come back as Papa Shango and fight Bray Wyatt. Two sinister supernatural men of the promotion’s past and present facing each other. Trying their own black magic on each other. Sounds crazy doesn’t it. I remember when these episodes aired when I was a kid. I wish they would re-air them. I’ve been watching Combs’ FF on Buzzr for awhile and they have yet to air them. I want to see them again! LOVE that Barry Darsow! 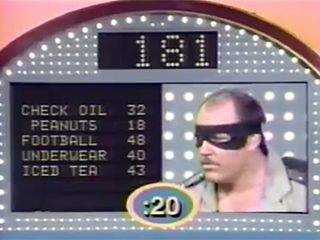 Buzzr seems to have the rights to about 25% of Ray Combs and Richard Dawson episodes, if that. I keep seeing the same episodes repeating. This is one of these inductions that always bring a smile to my face. It’s so craptastic, yet so good!